There's been a decent buzz about the football game that will be played tomorrow between Northwestern and Illinois at the famous Wrigley Field in northern Chicago. ESPN's Gameday will be broadcasting their weekly show from there tomorrow...and in doing so, giving the Notre Dame/Army game being played at Yankee Stadium a big old "thanks but no thanks". But once some images started to make the rounds online about the minimal zero space behind the east endzone, some people, myself included, started to wonder if the idea of playing this game in such tight confines was really such a great idea. It seems as if now the Big Ten is sharing the concerns of some folks, and has announced some rule changes adjustments in order to help protect the players from killing injuring themselves. One positive thing though is the buzz has been increased because of the threat of injury, and the fine folks at Allstate have enjoyed some very nice increased bang for their advertising buck. 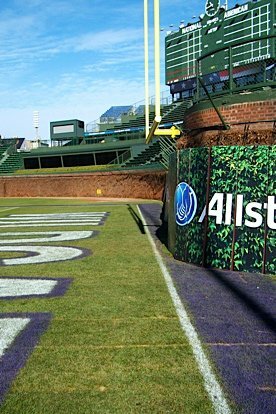 Park Ridge, Ill. – The Big Ten Conference announced a series of adjustments to football playing rules in order to enhance student-athlete safety for the Illinois-Northwestern game to be played on Saturday, Nov. 20, at Wrigley Field in Chicago. The Big Ten worked with both Illinois and Northwestern to review a number of potential rule or field adjustments to provide the safest environment for the student-athletes. The conference requested and received waivers to several NCAA playing rules in the interest of student-athlete safety. The following rule changes were determined to be the best of all options and will be in effect for this game only based on the unique layout of the field. 1) All offensive plays will head toward the West end zone, including all extra points and all overtime possessions. 2) All kickoffs will be kicked toward the East end zone. 3) After every change of possession, the ball will be repositioned for the offense to head toward the West end zone. 4) As a result of a coin toss held by the conference office Friday morning, Illinois will occupy the West team bench in the first half and Northwestern will occupy the West team bench in the second half and for all overtime periods. If safety was the primary concern, this game would be played at Ryan Field on the campus of Northwestern University. Let's not play it off as if safety is of the "utmost importance". Let's call a spade a spade. Making money is #1 (obviously). Having this game prominently televised is #2. Generating a healthy buzz is #3 (ESPN Gameday anyone?). Safety is probably #4.